Today's post is in response to a search term that people are using to land here, hence the new label "because you asked." I confess, it's a compilation of experience and some information and images found on the 'net. But if there's one thing I learned from teaching, it's that people just love love it when you share with them the tips and tricks that work. (That, and that half the class will only hear 50% of what you said, whether you're mic'd up like Madonna or not.) So rest assured, I'm sharing good info with you. But before we get to Fixing Crooked Combs in a Top Bar Hive, let's start with some prevention. Bees are pretty adamant about maintaining bee space, so the shape of one comb almost always conforms to the one before it. If you can get them started on a straight path, you'll really set yourself up for success with a TBH. To encourage the bees to build straight combs to start, I recommend using a follower board (AKA false back). When you restrict the bees' construction with a follower board, they are more likely to build straight combs. But don't cramp them, lest it encourage them to swarm. Make sure they always have 3ish top bars to build on, and monitor closely. Three bars is plenty of room for them to get creative, 2 bars less so and with 4 you're gambling. But give them what works for you. If you're nearby and can keep feeding in top bars, go with 2. If it's a bit of a drive to get to your hive(s) and you can't visit often, give them 4. 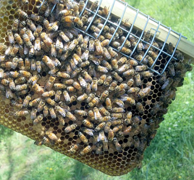 Commonly the bees will curve just one end of the comb, increasing in likelihood with the length of your top bar. In other words, 19-inch top bars are more likely to have curved combs than 14-inch top bars. You can cut it off (it's usually honey, so enjoy it) and hope they do better next time, or you can cut the curved part free from the top bar and push it gently in line. It'll be a sticky mess, but the bees will reattach it. When you have two properly spaced, straight combs, all you have to do is put one blank top bar b/n the two and you're golden. The bees will construct a new comb between them that will be straight. Repeat until the hive is full of straight combs. NOTE: Brood combs are the easiest to get the bees to build straight. Don't open the brood nest, though, unless you know the colony can keep an expanded nest warm. If you don't think the colony can manage that, then the next best place is where the brood nest meets the honey stores. This can work well, in the Spring or early Summer, to stretch the brood nest. Heavy honey comb should just be harvested. If you have a bunch of straight combs built diagonally across several top bars (crossed comb), use a long knife (like a bread knife) to cut as much brace comb as possible, then do your best to lift all the top bars across which the combs cross, together. The goal is to keep the combs in tact so as to avoid a disastrous mess in the hive. Once out, cut the combs off as best you can, trim off the honey band, then have the bees reattach the combs to top bars for you. 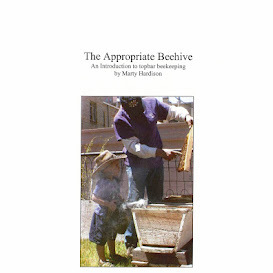 The image below (left) is a fast and secure way to hold the comb in place while the bees do this work. It's a viable route for those of us who don't have a table saw but do have access to a hardware store. Hardware cloth is way better than fiddling with string or rubber bands, which always slice into the combs, which never quite hang plumb. Rather than staples, I recommend using twist-ties to secure the wire cloth to the top bar (enables quick tool-free removal later). You will want to remove the wire cloth as soon as the bees have completed the reattachment. If you let the bees embed the wire cloth into the honey band, you'll have a sticky mess to deal with. Weather patterns, nectar flow, the size of your colony,… will all influence how quickly the work will be done. But you may be surprised how much progress they make in just a few days. 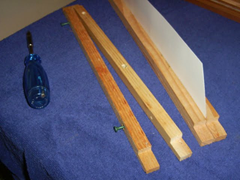 If you have the tools to split a top-bar, you can fashion a skirt-hanger type top bar like the image below (right) and rehang combs that way. Works with both tough brood comb and newer combs (as long as there's no honey getting squished). If you take either route, drop me a line and let me know how it goes. LEFT IMAGE: David LaFerney's "Simple Way" to tie in comb. RIGHT IMAGE: Garret's "Split Bar" is a follower board of sorts, for fixing crossed comb. The most cost effective and time effective way we frame #honeycomb from our rescues. We also put them in the transport box upside down, so by the time they get a permanent home, the #comb is right side up and attached to the top.